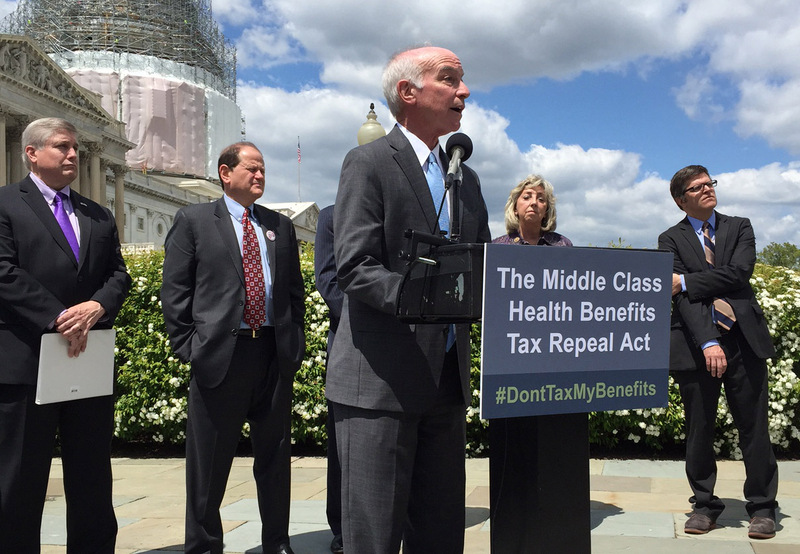 Rep. Joe Courtney Tuesday explaining his bill to end the ACA ‘Cadillac tax’ earlier this year. Washington — Rep. Joe Courtney expects to soon have at least a partial victory in his effort to eliminate a provision in the Affordable Care Act that has been attacked by both labor and business groups. The controversial measure in the ACA would impose a “Cadillac tax” on high-cost health plans provided by employers to their employees. Congress is expected to approve legislation this week that would push back implementation of that tax for two years, until Jan. 1, 2020. Courtney, D-2nd District, considers that a “glass half-empty” because he wanted an end to the levy on high-cost health plans. There’s support from both sides of the aisle to delay implementation of the tax. The Senate voted 90-10 last week to end it. Businesses and labor unions have lobbied Congress to end the tax – as have Connecticut’s municipal leaders. Their voices have been heard. But Courtney said it is unclear whether the two-year postponement of the tax will be included in a $1.1 trillion budget bill under negotiation between Republican and Democratic leaders or a separate bill that would temporarily extend a slew of tax breaks, including a popular research and development tax break. “But nonetheless, we’re in the mix,” Courtney said. A key component of the ACA, the Cadillac tax imposes an excise tax of 40 percent beginning Jan. 1, 2018, on health plans whose value is more than $10,200 for individual coverage and $27,500 for family coverage. Only money spent in excess of the caps would be taxed. The levy is aimed at curbing high-cost, high-benefit plans that labor unions fight for and many businesses offer their employees. But many companies hire older workers or employees in high-risk occupations who push up the cost of health care. United Benefit Advisors, a group of employee benefit advisory firms, said it’s a myth that only especially generous health care plans would be subject to the Cadillac tax. Courtney says many middle-income Americans would be hurt by the tax because companies would scale back benefits. That’s why he introduced a bill in February that would abolish the tax. “Politically, it pushes the issue off to the next administration,” Courtney said. Meanwhile, Congress is facing a Wednesday deadline to agree on a massive omnibus spending bill that would fund the federal government until Sept. 30, the end of the 2016 fiscal year. A deal has been elusive because Republican conservatives have been pressuring their leadership to attach a wish list of conservative policy riders. Democratic leaders are pressing to keep those riders off the bill and add a few priorities of their own. For instance, House Minority Leader Nancy Pelosi, D-Calif., hoped to add a provision that would repeal the so-called “Dickey amendment,” named after former Rep. Jay Dickey of Arkansas, that for 19 years has barred the Centers for Disease Control and Prevention from studying the impact that guns have on health. Those efforts appeared to have fallen by the wayside Monday afternoon.